In preparation for U.S. Thanksgiving, we’re republishing last year’s fabulous Whole30-approved Thanksgiving-inspired Steal This Meal submissions. A little background about these dishes, however. First, we aren’t encouraging anyone to do a Whole30 program during the holidays. 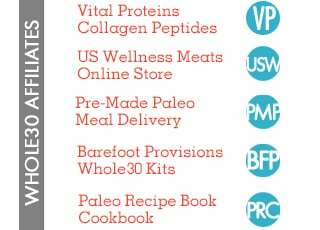 (And Melissa has an article coming out in the November/December edition of Paleo Magazine explaining the three reasons why taking on a Paleo challenge during the holiday season may not be a healthy undertaking.) 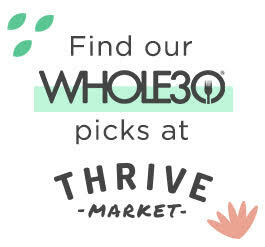 However, all of these dishes are Whole30 compliant, because (a) everything in our Steal This Meal series meets those standards, (b) this is a good opportunity to show your family and friends that your dietary choices are both satisfying and delicious and delicious, (c) we wanted to provide an alternative for for those of you who simply cannot eat conventional flour, dairy or other ingredients in “traditional” Thanksgiving dishes. One last note : These recipes aren’t designed to taste just like the original. That would be impossible, and disappointing for your guests. Instead, we encourage you to present these Whole30 dishes as alternatives – traditional Thanksgiving fare with a twist. This dish serves 8-10. We’ve used extra-lean ground beef and soaked walnuts, along with traditional spices and herbs, to give this “stuffing” the same feel and flavor as the original bread-based dish. Note, the extra-lean ground beef is the key – buy the leanest available. This will keep the stuffing from tasting too much like, well… ground beef, as much of the beef flavor is carried in the fat. This is best right out of the oven, and it smells just like the dish Dallas’ Mum makes. We thought it delicious, and the perfect accompaniment to turkey. Preheat the oven to 375 degrees. Chop all the veggies, the apple, and herbs. Saute the beef and celery for 3-4 minutes on medium heat, making sure that the beef gets broken up into really small pieces as it cooks. (Big chunks are not very stuffing-like!) We used a big saucepan for this, as we didn’t want the contents to overflow once everything was mixed. Add the onion and apple, and cook for another 2-3 minutes. Add the herbs, garlic powder, walnuts, and salt, and mix thoroughly. The beef should NOT be totally cooked at this point – there should still be some pink. Pull everything out of the pan, and dump it into a 9×13 baking pan (or two 6×9 pans), and bake uncovered at 375 for 30 minutes. Serve hot from the oven. We couldn't believe how much this looked - and smelled - like real stuffing! Serves 8-10. While we normally don’t recommend using fruit juice or dried fruit as a substitute for sugar, some added sweetness was necessary to offset the serious tartness of the fresh cranberries. We’re okay with figs and apple juice as a sub for sugar in a special occasion dish like this. However, make sure your guests know that our more traditional sauce is still pretty tart in flavor! The flavors do meld with time, and this sauce tastes even better the second day – which means you can make it ahead of time and store it in the fridge. This was so amazingly good, we put it on everything this week – eggs, baked Alaskan cod, even our burgers. Place the cranberries, apple juice, figs, spices, and ½ cup of water into a covered saucepan on medium heat. Bring the mixture to a low boil for 10 minutes (until the cranberries “pop”), and turn down to low heat. Simmer (still covered) for 15-20 minutes, stirring occasionally. Squeeze the juice from the orange into the sauce, and finely grate the orange zest (use the whole orange peel!) into the saucepan. Keep on low heat (simmer) for another 15 minutes. Store in airtight container in fridge until ready to use. Serve cold for the best flavor. 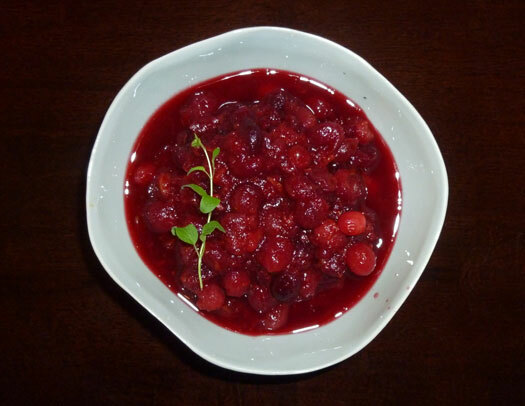 Delicious and pretty on your plate, our cranberry sauce is sure to be a hit! Whole9 Note: There are a million turkey recipes out there, but we liked this one because it’s perfect for a smaller gathering, and it won’t tie up your oven for the whole day, which means you aren’t juggling the main course, vegetable side dishes and desserts in and out of one appliance. Place turkey breast(s) in crock pot. Sprinkle on the paprika; this will give it a nice, golden color. Then sprinkle on the garlic powder and parsley. Cook on LOW for 8 hours. 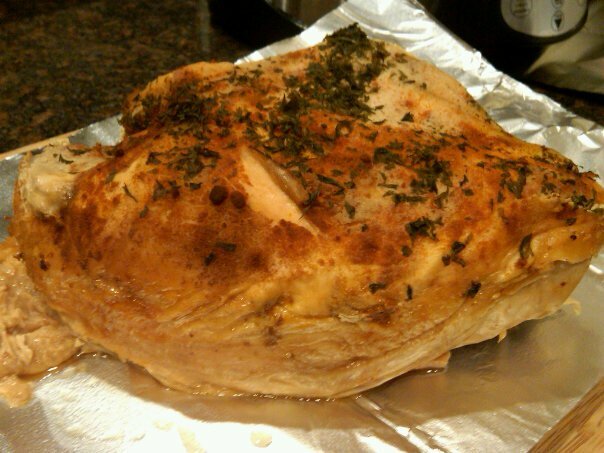 If you are making two turkey breasts so you have plenty of leftovers, cook on LOW for 9-10 hours. (Note, there is no liquid added to the recipe – although some water will accumulate in the bottom of your cooker.) Place turkey breast(s) on cutting board and immediately cover tightly with foil for 15 minutes. Slice and serve! Amanda’s Note: both are family favorites, and the best part is they are super simple! This is especially nice when you have a million other things to worry about on Turkey day. Add the olive oil to a pan on medium-high heat. Once it is warm, thrown in the garlic and saute until it gets a little bit soft. Add the prosciutto, cook until it’s crispy. Turn the pan’s temperature to low. Add the spinach a bit at a time; as it starts to wilt, add another handful, turning and mixing often. You want the spinach lightly wilted, not completely cooked down. Once wilted, take it out of the pan, place in a serving bowl and squirt with lemon. Ruth’s Note: This recipe represents so much of who I’ve become – not only a change in the ingredients, but how I respect and treat the food. 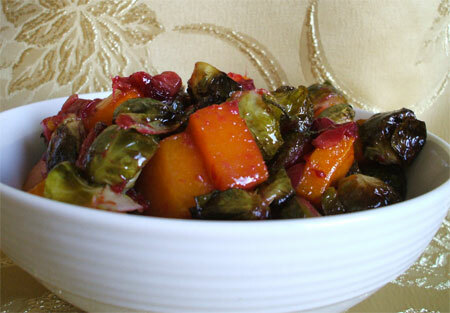 It features two veggies I used to avoid like the plague: Brussels sprouts and squash. I now think squash is sweet…when did this happen? Preheat oven to 450 degrees F. Remove skin, membrane, and seeds (reserve for future use) from squash. Cut squash into cubes. Trim and halve Brussels sprouts. Combine squash, sprouts, and cranberries in a large baking dish (or split into two if you don’t have a really large pan). Sprinkle salt on top and then add duck fat. Stir to combine. 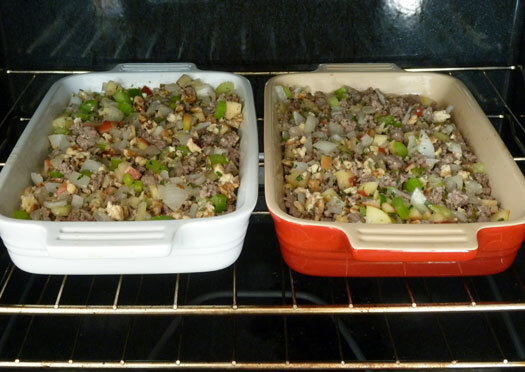 Place baking dish in the oven for 25 minutes or until the veggies are beginning to brown, stirring once or twice. Reduce heat to 350 degrees F and cook another 25-30 minutes until the veggies (especially the brussels sprouts) are cooked to desired tenderness. Serve warm and enjoy! Amber’s Note: Try to keep your relatives away when it comes out of the oven, this stuff is hot out of the oven, but it smells good ! Other recipes like this call for brown sugar, but really, that’s ridiculous. There’s so much sugar in the squash and sweet potato that it’s just not necessary. 1 small (around 1-1.5 lb size) acorn, butternut or other favorite squash. Preheat the oven to 375 F. Coat the bottom of a 10×10 dish with some of the coconut oil. Peel and cube the sweet potato. Peel, halve, clean and cube the squash. Place both in the dish and pour the rest of the coconut oil over the squash. Sprinkle the cinnamon and nutmeg over the top, mix it all up, and cover it with foil. Bake for 35 minutes, stirring occasionally. Amanda’s Note: Can you tell we love pistachios!? We just make huge batches and have them as a side dish with pretty much anything. These are great leftover, so don’t be afraid of having too much. Heat the oven to 375 F and arrange a rack in the middle. Rinse and scrub the beets, cutting off any leaves or little roots. Rub them with 1 to 2 tablespoons of olive oil, place them in a pan and cover with aluminum foil. Roast until tender and you can easily pierce with a knife; this will take about 1 hour. Remove from the oven and let cool. Once the beets are cool, remove the skins – they should come right off. Slice the beets in chunks, and sprinkle with a little bit of olive oil to make them glossy. Salt and pepper to taste. Serve the beets with the pistachio butter for dipping or spreading. One last note – you could make the beets the day before and let them chill in the fridge. Just take them out and warm them up a bit before serving and dressing. Lisa’s Note: We’ve already had thanksgiving here in Canada and I must say I felt like death afterward. I’m excited to see how everyone does with your Whole30 Thanksgiving! Here is a recipe for a dish I had at a client’s house this past weekend. It was delicious – almost felt like a “cheat”! Peel and cut the butternut squash into cubes. Add 2 cups of chicken broth, bring to a boil, simmer until fork tender. Drain off 1 cup of the broth and add in coconut milk (about half of a cup; more if needed). Add a dash of salt and pepper and a teaspoon of cinnamon. Blend in a blender or with a hand mixer – the texture should resemble mashed potatoes. Serve warm, with a sprinkle of cinnamon on top. 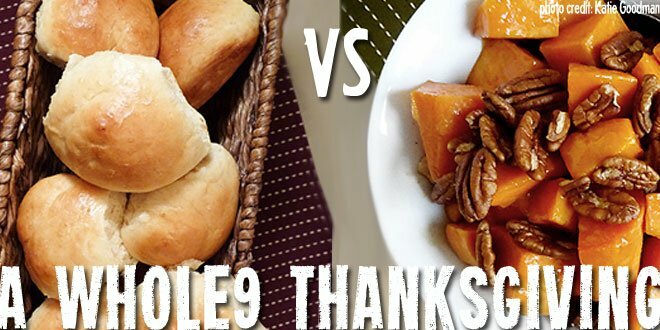 Whole9 Note: This is one of our favorite vegetable submissions, sure to please even the pickiest Thanksgiving guest. Preheat oven to 400 degrees. Mix together cider, 2 tblsp coconut butter, salt and pepper in a 9×13-inch baking pan. Add root vegetables, mixing until coated. Cover with foil. Bake 20 minutes, uncover and stir vegetables. Leave uncovered and continue cooking, stirring every 20 minutes until the vegetables are tender – about 1 hour more. While the vegetables are cooking, place walnuts in a cast iron skillet and cook over low heat, stirring frequently to avoid scorching walnuts. Remove from heat and add coconut butter, cinnamon and, if desired, a pinch of salt. Stir until walnuts are coated. Spread on a plate or cookie sheet to allow walnuts to cool slightly. When vegetables are finished, transfer to serving dish and sprinkle with the cinnamon walnuts. Pamela’s Note: This recipe uses the natural sweetness of the apples and yams to let you have a traditional pumpkin pie without the sugar. For the crust: Throughly mix all ingredients together except for the coconut flour. Add the coconut flour in and mix well to form dough. Knead dough for ~1 minute. Roll dough out between sheets of wax paper until it’s big enough to fit the pie dish. In my experience transferring the pie crust usually results in it falling apart to some extent, so just plan on patching it up a little bit once you’ve transferred it. For the filling: Thinly slice, peel and core apples. Coat with cinnamon and stir. Set aside. In a separate bowl, combine yam, cinnamon, ginger, and nutmeg. Beat in eggs gently until just combined. Slowly add coconut milk until combined. Layer apple slices and pumpkin filling in the pie dish. Bake in a 375 oven for 50 minutes or until a knife inserted in the center comes out clean. 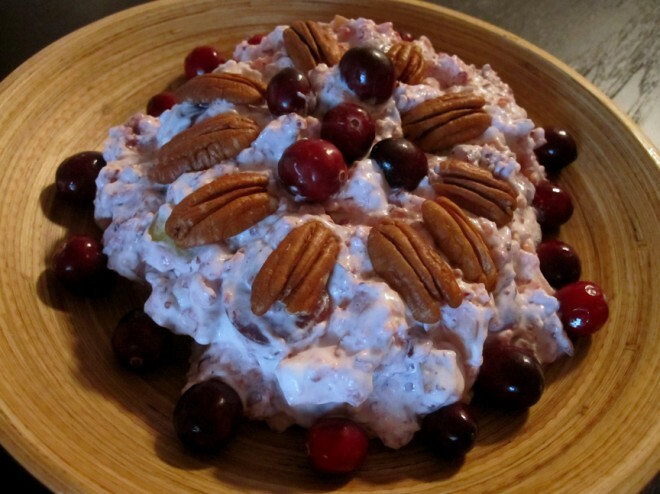 Meliss’s Note: My mom has been making this Cranberry Waldorf Salad for as long as I can remember. The original called for 1/2 cup white sugar, a bag of miniature marshmallows, and a whole container of Cool-Whip! So I put on my Whole30 hat, replaced the Cool-Whip with coconut milk, made dried apricots stand in for the white sugar, and eliminated the marshmallows altogether. The best part – it tastes as good as I remembered! I’m thrilled that this taste of tradition can be on our table this year. This salad works best if you do the prep, then let it sit overnight. Put your mixing bowl and beater in the freezer, and place the can of coconut milk in the refrigerator. Wash the cranberries. Place them in the food processor with the dried apricots and grind them until the mixture has the consistency of relish. In a large bowl, toss the cranberries with the cut apples and grapes. Cover tightly and place in the refrigerator so they can get to know each other. Forget about them until the next day. On Thanksgiving morning when you’re ready to assemble the salad, put the can of coconut milk in the freezer for 10 minutes while you chop the pecans.Take the bowl and beater out of the freezer, pour the chilled coconut milk into the bowl, add the vanilla extract, and beat the mixture on the highest speed of your mixer until it looks like whipped cream. This takes about 5-7 minutes. Marvel at the creaminess! When the cream is done, add the nuts to the fruit mixture, and gently fold in the whipped cream. Garnish with whole cranberries and nuts.